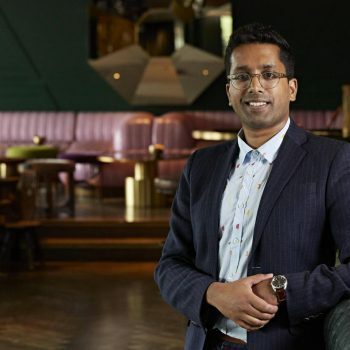 Ryan Chetiyawardana, the man behind the World’s Best Cocktail Bar, has announced plans to expand his cocktail empire beyond London for the first time, opening new sites in Amsterdam and the US, as well as a rebrand of its Dandelyan bar in London. Cocktail bartender Ryan Chetiyawardana, also known as Mr Lyan, opened his first bar, White Lyan, in London in 2013, which was the first cocktail bar in the world to use no perishables; no fruit and even no ice as part of its commitment to sustainability. While White Lyan closed in 2016, the focus on sustainability remains at Chetiyawardana’s subsequent venues, which include Super Lyan, Dandelyan and cocktail restaurant, Cub. This year Dandelyan, housed at the Mondrian (now Sea Containers) Hotel in London, was named the best cocktail bar in the world by the World’s 50 Best Bars team. Days prior to confirming the win, Chetiyawardana announced that Dandelyan would close after four years. Now the entrepreneur has confirmed plans, via his Instagram page, to open three new sites, expanding his reach beyond London for the first time. Chetiyawardana aims to open Silver Lyan in Washington D.C by November, rebrand Dandelyan as Lyaness, and to move his Super Lyan bar from its London home inside the basement of cocktail restaurant Cub to a new space in Amsterdam. Announcing the expansion, Chetiyawardana explained: “The name “Lyan” was a derivative of my name harking back to kids mispronouncing ‘Ryan’ as Lion (see the super adorable children’s drawing discovered at Mama Chet’s for reference) and given the family nature of our company, and the desire to create a personal link between our various projects, it seemed the ideal anchor for the business. “We also always wanted to have diverse projects – something that felt authentic, and as a compliment to the other wonderful, passionate projects out there, and to create platforms for the team to do their amazingness day in day out – so when you see the word Lyan, you know it’s ours, and stands for our unique take on accessible innovation, and the desire to have something inclusive, fun and honest that helps bring people together. And this includes the ones we kill.